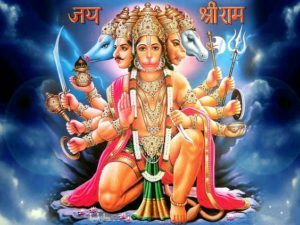 Shree Hanuman Kavach is considered the God of strength and power and is worshiped by millions of devotees every Tuesday. It correctly energized by prayer and meditation is the protective shield, which will protect the wearer against all perils and evils. Also known as, Pancha Mukha Hanuman Kavacham, Hanuman Raksha Kavach Mantra, Shri Maruti Kavach. kraim astraaya phat iti digbandhah.